STUDY IN LIGHT AND FORM: THE WRIGLEY, TRIBUNE, AND MEDINAH SPIRES” is a master work of talent, patience, and determination which celebrates the beauty and grandeur of the three most notable buildings in the City of Chicago. As a super-realist, black and white pencil drawing, line and composition were critical. Finding a spot along the Chicago River where the buildings came in close proximity to one another was also paramount for overall unity. And strong diagonals from all their different perspectives, with the heights and positions of their spires, created tremendous visual movement and aesthetic power. This piece is the pinnacle of the artist’s talent and will never be equaled or surpassed. After lengthy study, late afternoon sunlight was chosen for its tendency to reflect brilliant whites, while creating subtle grays and dark shadows. The dramatic range produces a deep, three-dimensional effect usually not found with the mid-day sun. One important aspect to the image is having a solid base for the buildings to rest upon. The stone balastrades, evergreens, and streetlights were pulled from a miniature green space on Wacker Drive, fifty yards to the west of the spot were Jack was standing to view the buildings. After many months of illustration, two major changes were made to the drawing’s foreground. 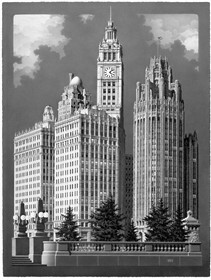 Notice in the drawing’s early progress, the southwest corner sculpture “Defense”, on the Michigan Avenue Bridge House, was substituted for an evergreen tree. The artist needed to balance the street lights on the left corner with another architectural element. The sculpture was the perfect answer to the problem, though the bridge is actually 700 yards to the east. Another evergreen was slightly repositioned to allow the Tribune Building’s extremely detailed, arched entrance to be fully represented. For the artist to draw comfortably in his studio, reference photographs were taken in February of 1987 to clearly capture the scene in brilliant, crisp, dry air (notice the background summer Cumulus clouds or thunderheads drawn for subtle diagonal effect). A powerful 800mm lens was used from 1/4 mile away on Wacker Drive, between Wabash and State. To help guide the artist, a 100-print collage of the 3 x 5″ photographs was then assembled. The original drawing was slowly and painstakingly outlined and illustrated from May 1987 thru October 1988 and took 3000 hours to finish. The 50 x 67″ original was drawn with ebony and 2B-leaded technical pencils on paper, and was produced oversize to fully document the details of each structure. With new digital giclee technology, custom prints of sizes up to 48 inches in width can be made available upon request. Jacknds@cs.com. Copyright 1989 All Rights Reserved. Jack Nixon, Nixon Design Studio.